This unique necklace will turn heads and get people talking as soon as you walk into the room. For a stunning look and feel, this is a great choice for a monogrammed piece of jewelry. Pendant size is dependent on the size of the name you choose, but it can be up to 1 + inches in length. The pendant is made from the finest of sterling silver and shines with a beautiful luster. This is a beautiful and original piece of jewelry that makes a great gift for any special occasion and is a way to keep that special someone close to your heart, no matter where they are. Apples of Gold makes extremely well crafted and quality jewelry and this is one piece that belongs in any collection. 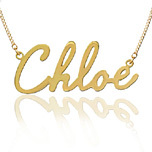 You can personalize this necklace with any name from 3 to 10 letters and comes with an 18 inch chain. The pendant measures approx. 1.25" to 1.50" long (depending on name) x approx. 10mm tall (between 3/8" and 7/16" tall). We guarantee our Personalized Sterling Silver Script Name Necklace to be high quality, authentic jewelry, as described above.